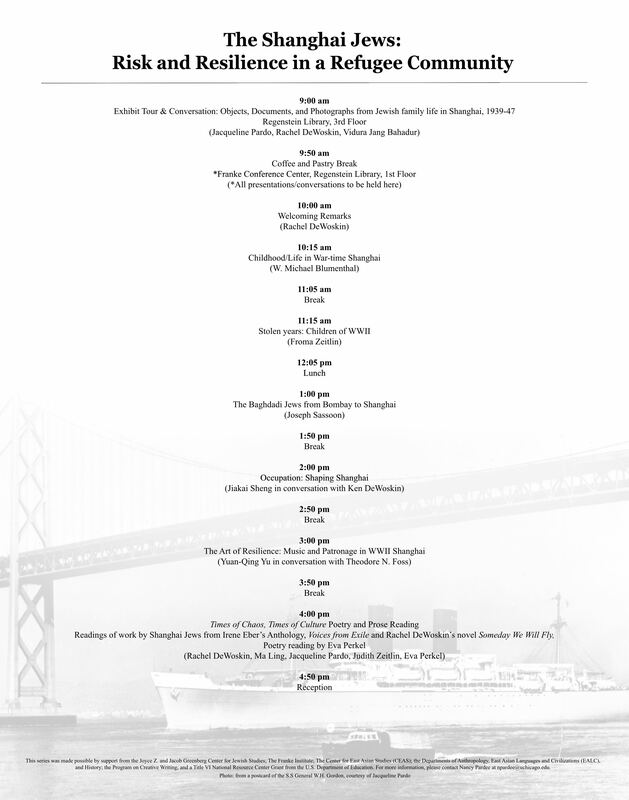 The Shanghai Jews: Risk and Resilience in a Refugee Community is an event series at the University of Chicago exploring the experience of many thousands of Jewish refugees who survived World War II in Shanghai. 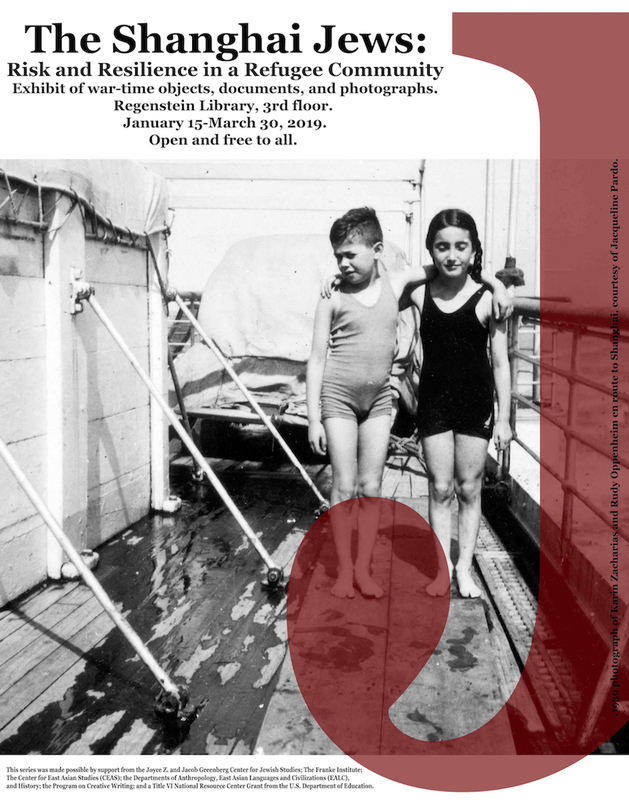 This series opens with an exhibit (January 15-March 30th) on the third floor of the Regenstein Library, featuring unique historical objects, documents, and photographs donated by families who lived in Shanghai during the war. 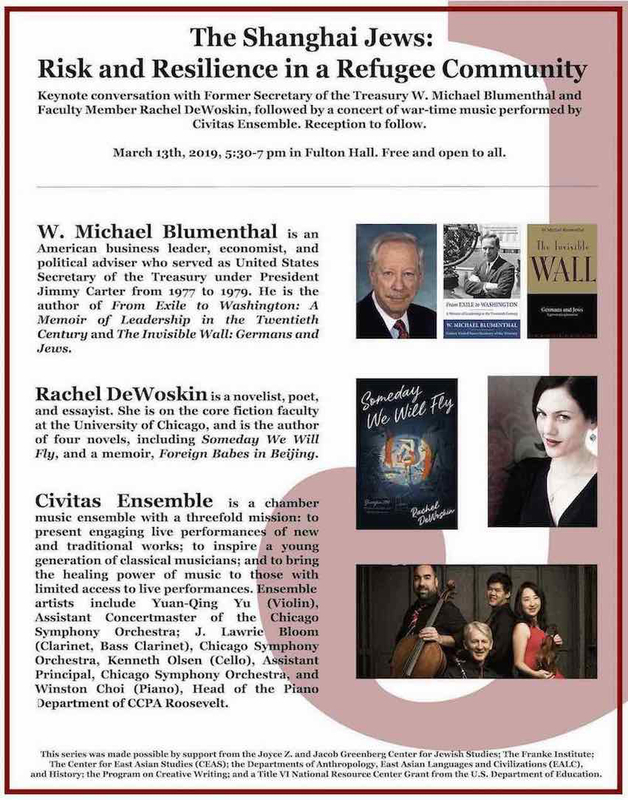 On March 13th, at 5:30 pm in Fulton Hall, the University will host W. Michael Blumenthal, who came of age in Japanese-occupied Shanghai and then went on to become President Carter’s Secretary of the Treasury. Following his keynote conversation with Creative Writing faculty member and novelist Rachel DeWoskin, there will be a concert of war-time classical music, performed by the Chicago Symphony Orchestra's assistant concertmaster, violinist Yuan-Qing Yu, and her quartet, Civitas Ensemble. 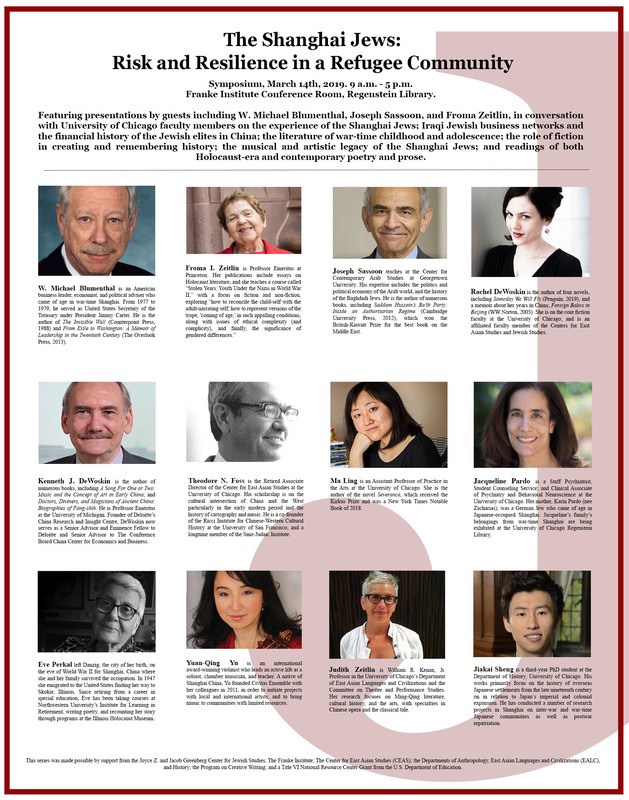 On March 14th, a day-long symposium will be held at the Franke Institute, featuring conversations between University of Chicago faculty and invited guests on topics including the experience of the Shanghai Jews; Iraqi Jewish business networks and the financial history of the Jewish elites in China; the literature of war-time childhood and adolescence; the role of fiction in creating and remembering history; the musical and artistic history and legacy of the Shanghai Jews; and readings of both Holocaust-era and contemporary poetry and prose. This series was made possible by support from the Joyce Z. and Jacob Greenberg Center for Jewish Studies; The Franke Institute; The Center for East Asian Studies (CEAS); the Departments of Anthropology, East Asian Languages and Civilizations (EALC), and History; the Program on Creative Writing; and a Title VI National Resource Center Grant from the U.S. Department of Education.